Whether you journey by plane or ped, bus or burro, car or cycle, there’s stuff out there that will make your trip easier, more efficient, economical and/or enriched. Let’s start with luggage. As airlines gouge charge more and more for checked luggage, carry-ons have become a major economy item. If you’re flying, you’re paying $25 or so per bag every time you board. 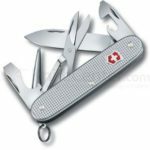 Even without its ten-year warranty, Victorinox Swiss Army Avolve 22 is a good investment. Despite its four sturdy wheels, the suitcase weighs less than seven pounds. It has a sturdy frame and a padded laptop pocket. 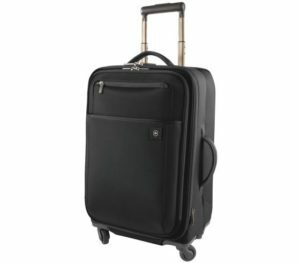 It rolls smoothly, packs a lot and stands up to punishing travel. The last piece of Victorinox luggage I owned survived a dozen years of my international trudging abuse. The Avolve retails for $250, sometimes sells for less. 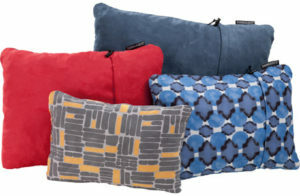 Once you’re aboard and in your seat, you’ll long for the pillows the airlines used to have waiting for you. No mo, my friend. So check out the Therm-a-Rest Down Pillow. If, like me, you’re not wild about blow-up pillows but don’t want to travel with stuff that adds weight or bulk to your pack, give the Therm-a-Rest a gander. Though it looks like an oversized shower cap, it’s actually quite comfortable, weighs nothing, and it squooshes down to the size of a softball. $30. Now that you’re comfy, you’ll want some soothing music. Trekz Titanium delivers. And without earbuds. Two things put me off about earbuds. First, few of ‘em fit my ears — maybe I’m not of woman born. Second, if yer snowboarding, cycling or running with scissors while Taylor Swift is singing “Someday I’ll be living in a big ole city. And all you’re ever gonna be is mean” in your ears, you may not notice that the Piston Bully, the Peterbilt or Pinhead is getting closer. 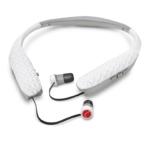 Trekz Titanium solves both problems. These wireless headphones — head, not ear — use bone-conduction technology to deliver sound just forward of your ear, not embedded in your ear canal. And this flyweight delivers heavyweight sound. Oh, and no, if you’re in seat 23B, the folks in seats A and C can’t hear what you’re listening to. $130. 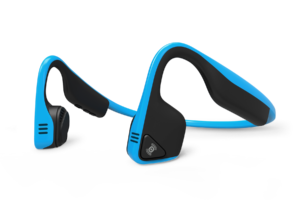 But if you like earbuds, AMPED Bluetooth Neck-Band uses different technology for a similar effect. Here, retractable earbuds extend from a flexible neck band, and not only play your songs but let you take your calls, and stay aware of ambient sound and the dangers it alerts you to. All for $130. And they deliver powerful sound to you, and no secondhand sound to your fellow travelers. OK, maybe you’re less a plane catcher and more a backpacker. Here’s a nifty gadget that will keep you from stumbling around the campsite in the dark. 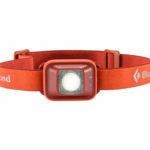 Black diamond IOTA LED headlamp is a midget with a giant wallop. The IOTA weighs in at less than two ounces, produces 150 lumens, enough to light your way through the darkest night. On low beam, its rechargeable battery lasts up to 40 hours, and it shines through sleet and rain. And, back in civilization, you can power it from your computer as well as the wall outlet. Its retail price is $40, but REI and others sell it for $25. Here’s another safety-conscious camping friend. With the Meta bottle & microfilter in your pack, you can scoop water from a stream into a plastic bottle, screw on the top, and drink clean water. What’s more, the opening is wide for easy scooping and pouring, the soft sides make packing easy, there’s no plasticky taste, and the $50 price is good value compared to, say, giardia. The only problem — the bottle’s circumference is too big to fit in the water-bottle pockets on my backpack and running belt. If that’s not a problem for you, I recommend the Meta. Every camper needs a knife — even if we don’t need one. Tradition demands it, and if/when things get tough, we’re glad we have it. Requirements? Sharp blade and reamer. Screwdriver and scissors. Can and bottle opener. Not too heavy or bulky. Easy to spot when you drop it in the dirt. Victorinox Swiss Army Pioneer X knife meets all those needs. But wait — no corkscrew? Bring New Zealand wine; it comes in screwtop bottles. Pioneer X retails for $54; often sells for considerably cheaper. How can I put this delicately? 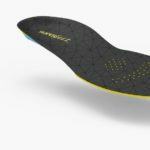 If you or the one you love have odiforous feet, wash your shoes, throw out the insoles, and pick up SUPERfeet Flex athletic insoles for around $30. they’re nicely padded, scientifically shaped, and come with long-lasting odor control. 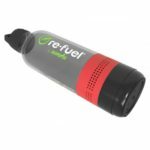 And finally, consider Re-Fuel 2-in 1 Bluetooth Speaker and BPA-Free Water Bottle. It’s so crazy it just might make become the most talked-about gift at the Christmas party. 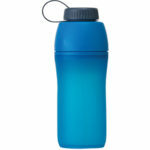 Yes, it’s a water bottle, though it only holds 12 ounces. And yes, it’s a waterproof speaker that plays whatever’s on your phone. The question is — who needs a bottle/speaker combo? 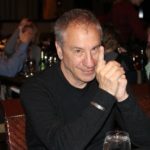 If, when you ask yourself that question, someone’s name immediately springs to mind — as it did to my mind — for $30, stuff the Re-Fuel in that lucky sod’s stocking. Jules Older’s ebooks, SKIING THE EDGE and DEATH BY TARTAR SAUCE, make pretty good stocking stuffers, too.